For the best possible lighting, is it better to photograph Santa Elena Canyon at sunrise or sunset? Thanks! 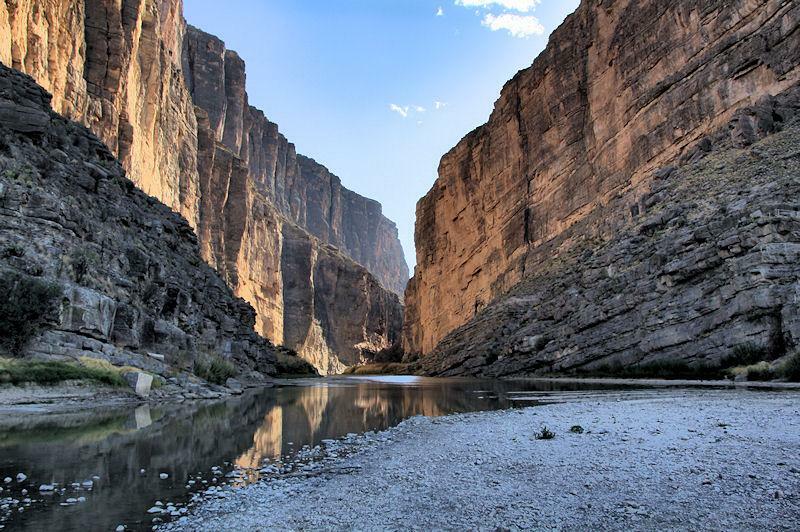 The fault that Santa Elena cuts generally faces slightly north of east and the river emerges roughly perpentidular to the fault face so most of the conventional pictures of the canyon would be with morning sun. Very often, though, pictures that break the rules in photography can be very striking. 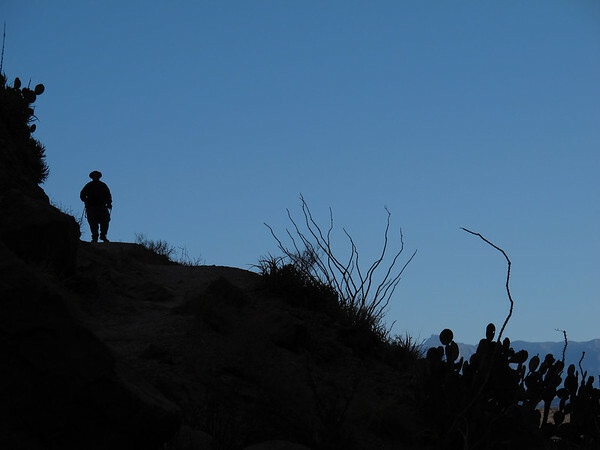 No doubt some talented photographers have captures striking silouettes of the canyon and TJ Avery takes wonderful wide-angle pictures in the dead of night. Didn't think until after I hit enter. OK. Sorry for dominating this thread but I keep thinking about it. While checking the mothernatureframed. com website I found this shot by Ray Muniz/Stingrey. It was taken at either before dawn or after dusk. I can't tell. So, if you can get there near sunrise, you'll get a very nice picture but whether it is close to noon or after dark, there are always opportunities. Just be sure to post up your result. Thanks Kevint! This is very helpful! Basically you can set a point on the map, set the date and time (now or in the futuire), and it will show you the direction of where the sun/moon will rise/set. You can tweak it minute by minute too. It's an awesome app that's perfect for planning lighting for a shot. I highly recommend checking it out. They have an Android and iPhone app too for it..
WOW! Thanks Lance. This is an app that will come in handy. I'll check it out. 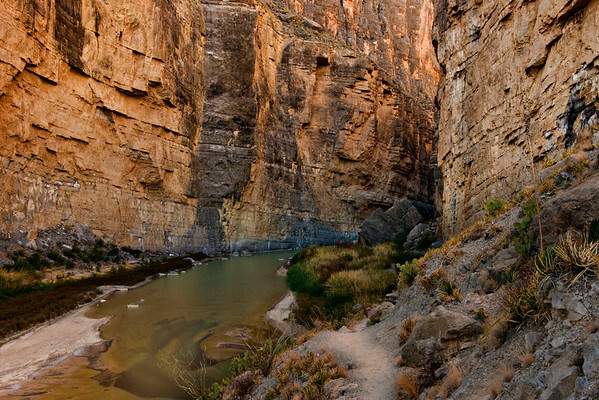 down the river exit of Santa Elena canyon fully lighting up both canyon walls? Or am I doing it wrong? It looks like just pre-sunset to me, no? It is a very nice shot. FartyMarty, another tool I've played with is Google Earth. I used it to see where I would have to be to see the sun set through The Window. Figured out it wasn't possible at New Years. 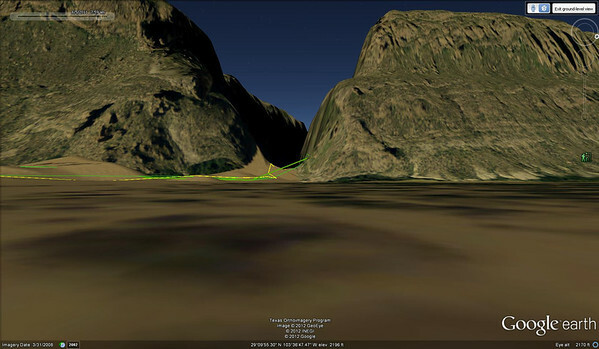 In Google Earth, set your self up with the view you'll have when photographing. Click button at the top of the screen that looks like the sun setting behind mountains. Then set the month and day on the time slider that you want to investigate. I don't think the year matters as long as you are within a few thousand years of the actual date. (I actually had to click the wrench and couldn't set any dates beyond April of 2012) By setting the time at about 9 am and clicking through the months, it appears to me that right now is about your best time of year to get the effect you want. I'm pretty sure this picture will be in the annual calendar. For some reason, Google Earth never really illuminates the south wall very well but in a relative sense, it appears this is a good time of year. I think the issue is that the south wall was dark when the satellite image was taken. To test that, I moved myself inside the canyon and looked out. The morning sun shines into the canyon for only a month or so around this time of year. You can still get some useable shots in there during the middle of the day. Contrast down in the canyon also shows well with hdr..
Yep, you're doing it right. One thing to remember though. You may have something blocking the sun on the horizon at the time, so getting light in the canyon may not occur until later. The app has a function to help with these types of situations as well. The secondary map location function allows a number of geodetic calculations to be performed. Perhaps most important to the photographer is the Apparent Altitude. This is altitude, adjusted for refraction, between the primary and secondary locations, positive when looking up at a mountain, negative when peering down into a valley. Additionally, the secondary marker location may be used to set the elevation above sea level of the true horizon, allowing the height above the horizon of the primary location to be calculated. The visible horizon of an observer elevated above the ground lies farther away. 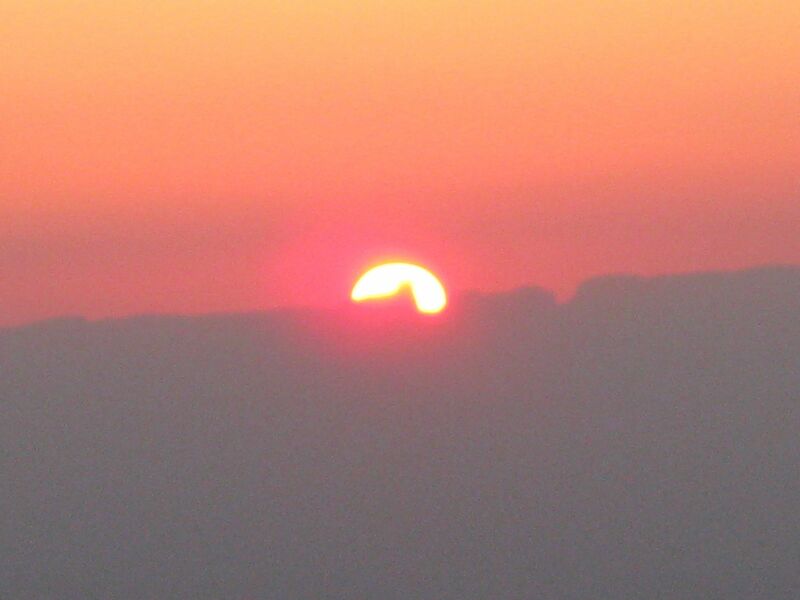 Consequently, rise times are earlier or set times later. 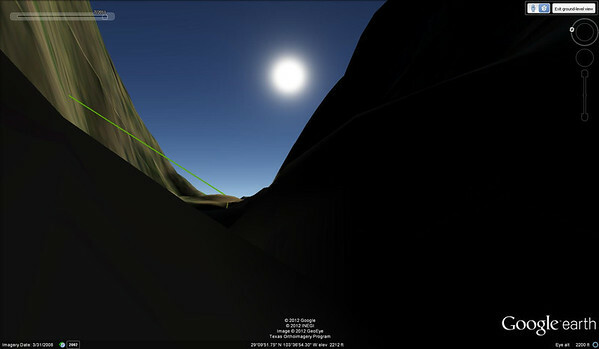 Kevint's suggestion of using Google Earth's feature to visualize the lighting on the landscape is great as well. Combined with TPE, these tools are great ways to plan a shot. One thing to remember though. 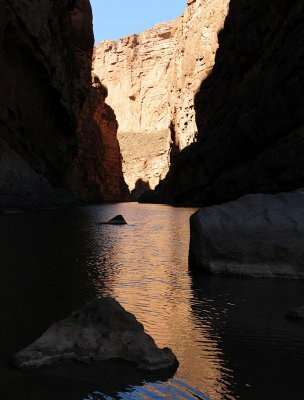 You may have something blocking the sun on the horizon at the time, so getting light in the canyon may not occur until later. Good point. It might be best to let it rise a little further north (early June through late June) and just wait for it to move south until both walls are lit properly. That should work unless you are trying to get that first orange glow on the walls. I had messed with GE for this but like Keven said, it doesn't light well enough to give me confidence in it's accuracy. That and I have found other lat/long differences (inaccuracies) between GE and various GPSs. Using the two tools together is a nice way to instill confidence. If I remember right someone was able to get the Sunrise right at El Pico (El Pico silhouette, was it Al?) anyway this would be a good tool to try and determine where to be to recreate that since unlike Santa Elena one could just change locations throughout the year. FM, nope. I tried but failed. Thanks to you all for your patience during my off topic diversion. to get the blue sky and the dark canyon walls to show up with out it. At least it is for photographers like me anyway. hey guys, sorry i did not see this one sooner to help out on the time i took my photo of the canyon that was in the Calendar. Marty you were very close on the day I took that. It was actually in July of 2011. It was taken in the evening just before sunset. Casa Grande, Stingrey and I were chilln' down by the canyon, i did a set of bracketed exposures and made an HDR image to get the interior of the canyon to look the way it did. I do very mild processing when making an HDR image so it looks more natural than WAY over processed. On the other photo that Stingrey took (MothernaturedFramed) it was taken around midnight or so when the moon was full and high in the sky to light up the canyon. I forgot the exposure length, but if i remember its about 20 to 30 seconds or so.